Express your love or your style with these cute studs. These demure, heart-shaped earrings easily communicate your affection or simply your fondness for jewelry that's undeniably pretty and fittingly feminine. Three-dimensional hearts are crafted from 14K rose gold, adding warmth that accentuates the meaning of these symbols. The petite size of this pair allows them to softly make a statement without screaming, and to draw attention to your face without competing with your smile. Whether you give them to someone you care about or choose them for their understated beauty, there's a lot to love about this uncomplicated, attractive pair. Earrigns are 5mm and have standard push back posts. 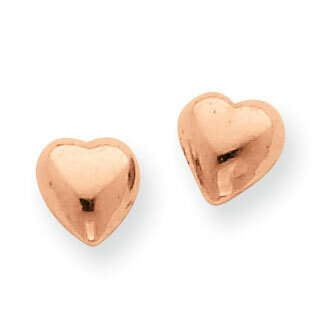 We guarantee our 14K Rose Gold Heart Stud Earrings to be high quality, authentic jewelry, as described above.